Political solutions can’t keep up with the rapid pace of change, said Sherman in her keynote speech at the NASW Social Work Pioneers 13 annual program and luncheon held in Washington, D.C., in October. Sherman, was among the 17 2017 Pioneer inductees. She is the former undersecretary of the State for Political Affairs at the U.S. Department of State. Among her achievements is leading the U.S. negotiating team to a successful conclusion of the Iran nuclear agreement in 2015. She was awarded the National Security Medal by President Barack Obama in recognition of her diplomatic accomplishments. 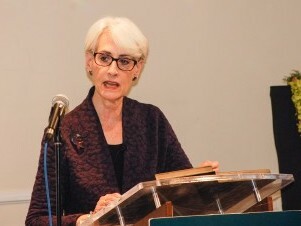 Sherman offered her unique insight of how the world will be changing in coming years. One example was artificial intelligence. “Everything will face disruption in the future at an accelerated pace,” said Sherman, who currently serves as senior counselor for the Albright Stoneridge Group. People will still be the greatest resource, she explained, but organizations must learn to adapt and provide technology training to its workforce. Other challenges include climate change, Sherman said. It will drive everything, from supply chains to pandemics, to human and economic growth to the supply of water. Nearly half the world’s population, some 3.5 billion people, live near coasts, she explained. As the climate changes, their lives will be impacted. “The skill set I learned at the University of Maryland School of Social Work has always been my core skill set,” she said. Sherman was child welfare director in Maryland before she became chief of staff to social worker Barbara Mikulski, who served in the U.S. House of Representatives. Sherman then managed Mikulski’s successful run for the U.S. Senate. She added that when she was involved with complex negotiations with other countries, including Iran, she once again relied on her social work education. Her final suggestion to attendees was the importance of teaching civics. Attendees also heard from Philip W.S. Fish, vice president and adviser to fiduciaries at Sandy Spring Trust. He discussed the importance of planning in the four stages of a person’s life: working, retirement years, incapacity, death of a loved one and legacy.